St. Catherine's is a Roman Catholic church on Meath Street, Dublin that is in use today. It was dedicated in 1858 and is the second church to occupy the same site. There is also a small grotto dedicated to Our Lady of Lourdes located on the grounds. There has been two churches on this site, the first being an octagonal chapel opened in 1782.The chapel and a presbytery were knocked down to make way for a bigger church. The foundation stone of the new church was laid on 30 June 1852. The architect was James Joseph McCarthy and construction of the main church was completed in March 1858, but the original design of the upper portion of the tower and spire were never completed. The church was dedicated to Catherine of Alexandria on 30 June 1858. James Joyce's first short story, The Sisters, concerns a former priest of St. Catherine's Church, Meath Street. 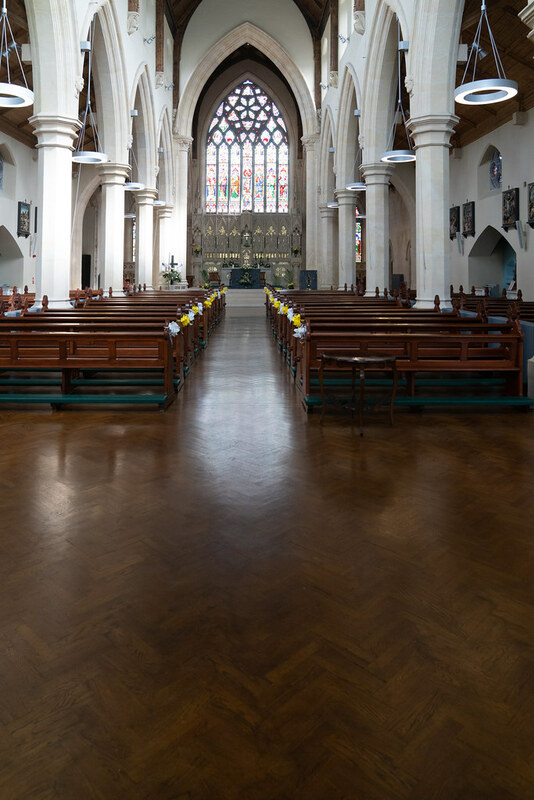 Ten years ago I could visit any church in Dublin at any time of the day but more recently I am finding it very difficult to photograph church interiors because they are usually closed and this is getting worse with the passing of time. However, today I was lucky as St. Catherine's was open and better still there was no one in it. In January 2012 this church was was almost destroyed because of an arson attack. A 49-year-old homeless man admitted setting the straw in the crib alight. Eventually He was found not guilty by reason of insanity after a trial at Dublin Circuit Criminal Court but he was committed to the Central Mental Hospital. After a closure of almost two years and restoration and reconstruction costing €4.1 million, the church the church reopened to the public in December 2013.